It is rare that any Report conducted by Government, or any its Agencies, is so straightforward that it requires no interpretation or commentary. 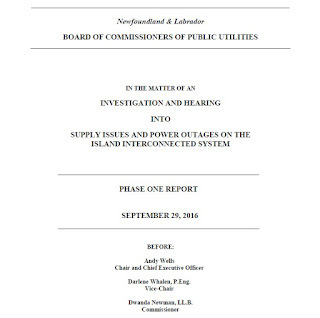 The Public Utilities Board has just released its FINAL Phase One Report on what led to the outages - now inscribed in history as #DARKNL - and who is responsible. This Blog has frequently reported on the PUB's work as well as on the Reports of The Liberty Consulting Group - the PUB's Consultant. I have reprinted the Board's short conclusion here and I have added a very brief note at the end. It is truly an eye-opener as to how poorly "state-owned enterprises" (SOES) like Nalcor, of which NL Hydro is a subsidiary, are run. BERN COFFEY: “EPIPEN” FOR A DITHERING PREMIER? Dwight Ball’s appointment of lawyer Bern Coffey to the position of Clerk of the Executive Council at first seems another misstep. But it may actually be one of Ball’s better decisions. It is true, as some have noted, that the appointment of a partisan to the position sets a dangerous precedent. Presumably the province intends to stay committed to the British model of public administration — in which partisan politics and the operation of government remain separate. Therefore we should regard the choice of Coffey as a “one-off” owing to his skills and history. Then, too, the Premier has confidence in him, which is fundamental. Taken together, these are sound reasons why Bern Coffey’s appointment will advance the public interest. Coffey ran unsuccessfully as Leader of the Liberal Party. The Premier unwittingly denies he is a political appointment — because he has professional qualifications. But this is just another example of the Premier’s inability to use the truth to help bolster his own case. He should not be dismissive of partisans. Without them, his meagre 17% support would be a lot less. Nevertheless, this is an occasion on which to cut Ball some slack. A new portfolio awaits Finance Minister Cathy Bennett — assuming she doesn’t quit first, or refuse a demotion. Liberal Party insiders report that Premier Ball’s next Cabinet shuffle will see a new face in the Government’s most important and prestigious Ministry. Why is the writing on the wall for Bennett? To begin with, the rules of politics are simply against her. But, in addition, Bennett has not demonstrated either the heft or the skilful art of politics essential to survival in a time of great crisis. Besides, in full public view, the Premier has told the Minster to take her fiscal plan and stuff it! A weak and vacillating Premier has discovered he is unpopular. The rulebook demands that someone — other than the Premier — is blamed. Giving the matter additional urgency is that a few people from inside the Caucus, and at least one from outside, want his job. It is tough to keep up with the craziness. A few weeks ago Danny Williams was in the media saying that the Muskrat Falls project is still a good deal for the province and that we shouldn’t be concerned because all megaprojects experience overruns. He repeated an assertion that should bring howls of laughter (derision actually) that the project will bring in hundreds of millions of dollars to the province. At $11.4 billion and counting you have to be pretty brazen to make the claim, as did Williams, that your biggest concern is that "someone is going to screw it up." Now, Williams wants the entire Province up in arms because Stan Marshall is said to be negotiating away Muskrat Falls, Gull Island, and the Upper Churchill (again) to Hydro Quebec. Marine clay, commonly known as “quick clay” and as “sensitive clay” by geotechnical engineers is clay deposited through salt water where the particles pick up salt, which alters the properties of the clay. The clay becomes “sensitive” since it has a propensity to liquefy when disturbed or saturated. It has been avoided by dam engineers due to its sensitivity. This explains the controversy surrounding the North Spur dam at Muskrat Falls since it will be the first hydro dam built on a quick clay foundation. Likely everyone remembers #DARKNL. January 2014 - successive days without power followed by rolling outages - tens of thousands of people huddled in the cold and the dark. It didn’t sit well with anyone – just ask Kathy Dunderdale. The PUB initiated an investigation into the root cause of the power failures. The Liberty Group, a Consultancy, was hired to conduct the inquiry - which had two phases. The Phase I Report, released last year, gave exhaustive details of the poor management culture at NL Hydro, the dreadful state of maintenance on Hydro’s generating assets, and the need for more generating assets to enhance reliability – which led to a new generator (sort of) installed at Holyrood. 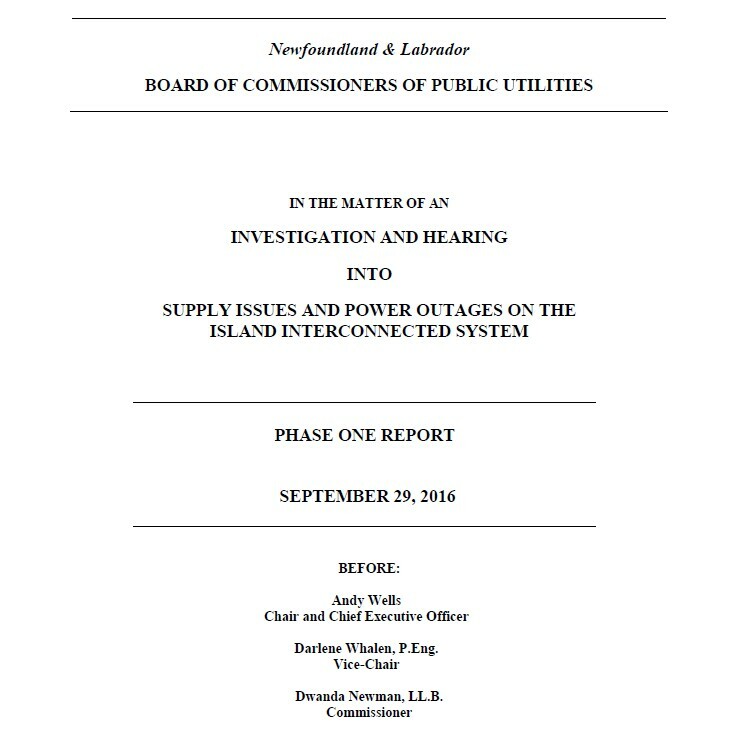 The Phase II Report dealt with an “assessment of the adequacy and reliability of the IIS (Newfoundland island system aka “Isolated Island Service”) to meet customers' load both up to and after the interconnection with Muskrat Falls.” It was released August 19th. Liberty is quoted frequently in this Post. It is best that this narrative is described in the Consultant's own words. Don’t think for one moment that Chris Mitchelmore’s absence from the podium for the 100th Anniversary Ceremony at Beaumont Hamel was anything but a deliberate snub by the Federal Department of Veterans Affairs, of a lowly Minister from “the boonies”. Telegram reporter Barb Sweet reviewed 300 pages of materials obtained under access to information legislation for her story in the Saturday edition. They contain an indictment of a Federal Government all too willing to lie and to engage in cover-up. The conversation described by the reporter between the local Honour 100 lead, Melanie Martin, and Peter Mills, project manager for overseas events at Veterans Affairs Canada, would have us believe the affair was an “oversight”. But the truth is something far different. Mills, undoubtedly with senior officials in Veterans Affairs in the loop, dealt with provincial officials as if they were a group that had — to use the idiomatic expression — ‘fallen off the turnip truck’. The recent Decision of the Quebec Superior Court rejecting Nalcor’s interpretation of the Upper Churchill Renewal Contract constitutes a very significant loss for Newfoundland and Labrador. The loss is felt not just because Nalcor was barred from accessing surplus energy from the Upper Churchill. It skewers the concept of water management on the Churchill River, a Plan essential to maximizing the power potential of Muskrat Falls - especially the plant's capability to meet maximum scheduled demand. Water management is pivotal to any claim to viability of the project. The Water Management Agreement (WMA), approved by the provincial PUB, is best understood as an “energy bank”, one that makes provision for an independent coordinator to record power delivered to the Upper Churchill from Muskrat and from the Upper Churchill to Muskrat when the plant was capable of producing surplus energy. In that way the water flows are coordinated and their conversion to electricity maximized. Water management is a perfectly sensible idea. But it can’t be implemented if the legal authority to operate it is void.